As we pack to leave (insert sad face) I want to thank you and everyone at GVR for all you do. It was so scary buying our dream get-away from across the ocean and you have made this process seamless. Everyone we have dealt with has been professional, friendly, prompt, above and beyond. A valve in an upstairs toilet began to leak the day our guests arrived. In short order, GVR arranged to have the water shut off until a plumber arrived, moved the guests to a new location, and had a plumber fix the leak. Since the water had seeped into the wall, they followed up with a restoration company, to ensure that there would be no mold or mildew issues. GVR also worked with our insurance carrier, and helped us get all the paperwork needed to file a claim – including a statement of lost income. This was a bad situation for us being so far away, but GVR stayed on top of the restoration, and now it is a good as new. In the end, the guests, although irritated, did not write a bad review. GVR did everything they could to help them relocate and followed up with them (as per GVR’s usual policies). Before we signed with GVR, we took the time to read the guest reviews, I love the way they focus on the guests and work hard to ensure that they have a good experience. People spend a lot of money to get to the islands, and look forward to it for months, so the expectations are very high. Their guest reviews consistently show that GVR does an outstanding job of providing a lovely experience. We purchased our condo with the intent of eventual retirement to this beautiful island, and that time has now come. In the interim period, the condo was managed by GVR and the rental occupancy of our unit surpassed even our most hopeful expectations. They do an outstanding job of advertising, managing the clients, unit maintenance and communication with the owners. I feel very lucky to have had this positive experience and wish to acknowledge the company for a job exceptionally well done! If you are looking for a professional team to market, manage and maintain your rental, this team has to rank in the top tier of all on-island management companies. They don't nickel and dime us!!! Many rental companies we had worked with in the past were charging us for every little thing, and those charges kept getting bigger and bigger. I know I won't have any surprises with Great Vacation Retreats. They take care of the small things in our unit at no charge. The fees charged on our unit are very reasonable. We're making better rental income with Great Vacation Retreats. With one company, one of our unit's gross for three months was $13,000 and we received a net check of $3,000. Their fee was 77%! Now, we're getting anywhere from a net of $4,000 to $5,000 or more a month. Service, service, service! I can't tell you how many renters have sent emails to Amy thanking her for the incredible service they've received from her and her management team over there. That means more repeat business for our units. I just talked with a friend yesterday who we referred to Amy and he's so happy. He said Amy treats him like a client and with respect. He said his previous company never acted like they really cared about his property. His revenue has increased and the move has been both personally and financially profitable for him. I would urge anyone looking for a property management company to work with Great Vacation Retreats. They are the best! Feel free to contact us by phone or email for a referral. I am writing this letter in support of Great Vacation Retreats and their management of our unit in Sea Village #4207. We had concerns about using an off island management company at first. We met with Amy Grant at our condo on Kona and were totally impressed with her. Her knowledge of the industry and the use of the Internet was very impressive. She put to rest all of our fears. Great Vacations Retreats has done an excellent job in maintenance, cleaning and the bookings has greatly increased our income from the unit. Since joining Great Vacations we have met and become greatly involved with Linda Sylvester who is Amy's right hand. Any issues and problems are handled through her in a timely and professional manner. She is a loyal and hard working individual and is a great help when needed. I recommend Great Vacations Retreats without reservation - they are a great company. So many ways to express it but the simplest is this...... NO “nickel and diming”. We joined Great Vacation Retreats in 2009 after previously being with two large south shore agencies. We cringed every month when we opened our statement to find yet another long list of incidental charges for which we had no say so in or control of. Amy Grant promised us greater control over expenditures and a relationship that would more like a partnership. Great Vacation Retreats has delivered on that. We appreciate the more personal touch and flexibility given in many ways versus the “cookie cutter” approach of the large agencies. Great Vacation Retreats is always looking for creative and new ways to expand the base of customers and while growing has been able to maintain the personal touch. We would recommend a look at GVR for any owner considering a change. We are writing this letter to express our sincere pleasure in doing business with Great Vacation Retreats for a little over a year now. We purchased our condo on Kauai in 2009 and signed on with another management company. They were really impersonal and were charging a much higher percentage to manage our property. We left them because we were feeling they forgot who owned the unit. Great Vacation Retreats has lived up to everything that was presented to us at our initial meeting. I have dealt with most of the employees at GVR and have been thoroughly impressed. Our guest book is full of compliments not only on our condo, but how clean it is and well represented online. GVR has a great website for potential guests and is really user friendly for owners. We can book our own reservations (or our guests), see our statements and our calendar well into the future. We feel like GVR treats our property as if it were their own. The contact between us and GVR is perfect, not too intrusive, yet we feel as if we know a lot of what is going on “on island”. They have a great presence on social networking sites and our unit is renting really well. We could not ask for more. We are happy to talk with anyone personally who is considering having Great Vacation Retreats manage their property. We are confident living in California that our investment on Kauai is being well cared for when we can’t be there. As an owner/manager of a Poipu Shores condo, I have nothing but praise and gratitude for Great Vacation Retreats and the superior services they provide. Living on the mainland presents numerous challenges while striving to maintain high standards with regard to our vacation rental. For years, I have limped along, putting out fires from afar. Needless to say, it is very stressful when unexpected maintenance issues arise. Great Vacation Retreats (GVR) not only schedules contractors to take care of any needed maintenance, but they meet with the contractors to ensure the job is completed to their/our satisfaction. GVR has several contractors who work closely with them giving GVR priority status. Great Vacation Retreats has been cleaning our condo for two years. I call each and every guest while in our condo. I have received only positive comments on the cleanliness. Not once have they missed a cleaning. They are extremely professional, honest, and reliable. They work hard to accommodate late check-outs when possible. When a special occasion arises, Great Vacation Retreats will have a bottle of wine, flowers, or an assortment of local coffee, cookies, etc awaiting our guest’s arrival. GVR immediately replaces items that break such as coffee maker, toaster, TV, etc. keeping value, cost, and aesthetics in mind. I truly cannot stress the importance of having an “assistant” on island taking care of issues, large or small, in my absence. As property managers of nearly three dozen condo’s, Great Vacation Retreats understands the importance of maintaining a professional, courteous staff and they know just what is required to keep guests happy and returning, which is the bottom line. Since working with Great Vacation Retreats, my business runs so much smoother, and I have the security of knowing someone is on island to take care of anything that may come up. The benefits for our guests, of working with GVR, are numerous. Immediate attention and replacement of a non-working items; an extremely well maintained condo; fresh linens that are replaced prior to becoming worn out; just to name a few. I thoroughly trust Great Vacation Retreats to be the face of my business. I am very proud of the upgrades I can offer as part of my guest services such as grocery shopping, rental gear, rental cars, and tour bookings. Please contact me at (360) 573-1516 or email [email protected] for a referral! 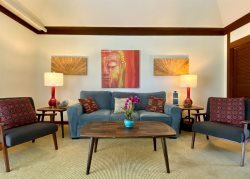 My wife and I would like to thank you all and tell you how much we appreciate your help and efficiency in managing and renting our condo Poipu Sands 122. We have found your entire staff to be responsive, knowledgeable and prompt in addressing our concerns and those of our guests. Just by way of history and comparison, we have owned this condo since 1988. Until early 2013 we used another rental agency. They were also courteous and attentive but at a high cost. With passage of time the charges, mostly related to "marketing and advertising", became high, with the net result, or bottom line, that we were lucky to get 25 cents on the dollar from our rentals. Since we switched to GVR our income has doubled due to increase in rentals and less extraneous charges.